Is the Inflation Monster rearing its ugly head? Forty-one percent of respondents think the US economy will improve in the next six months, compared with 29% who expected improvement back in October 2010. Over the next six months, two-thirds of respondents expect to increase the prices or fees charged by their companies. This is a doubling of the 35% that said the same thing six months ago. In the same survey, 65% say they’re concerned about a double-dip recession—about the same number who expressed that opinion last fall. My Thoughts: So, is the Inflation Monster rearing its ugly head? And what is your company doing about it? As converters, you have for years now held the unenviable middle position between rising raw-material prices from your suppliers and the “hold the line on prices, no matter what” attitude of customers. I’m thinking your only current recourse has been to add fuel surcharges to shipments in an almost vain attempt at dealing with nearly $5-a-gallon diesel. It should come as no surprise that higher crude-oil prices are also having a noticeable impact on inflation. The US Producer Price Index was up 5.8% year-over-year back in March already—the biggest increase since March of last year. The Consumer Price Index was up 2.7%. But these are “overall” numbers. What matters most right now to your real end-user consumer customers, though, are energy costs—like the 27.5% jump in gasoline prices during March alone. How much of that cost is NOT going toward purchasing the goods that are sold in your packaging materials? Most analysts say there’s a six-month lag between long-term higher energy prices and their real impact on the US economy? We may see the dreaded Double-Dip Recession hitting just in time for Christmas. Are you making contingency plans—just in case? This entry was posted in coating/laminating, flexible packaging, labels, package printing, paper/paperboard/cartons and tagged converting, crude oil, flexible packaging, inflation, labels, packaging, paper, paperboard packaging, plastic film, printing, The Great Recession. Bookmark the permalink. 2 Responses to Is the Inflation Monster rearing its ugly head? Mark! 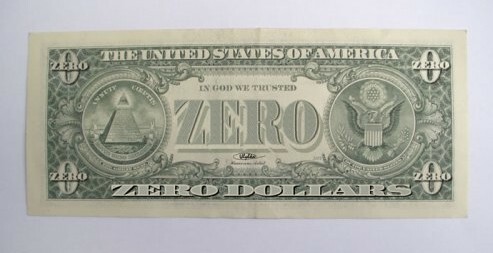 I love the image of the Zero dollar bill. Made me laugh … and then cry. Thought we already saw a bit of the double-dip. We may be in line for a three-peat. If anyone cares to do their homework, our government and illustrious Federal Reserve are acting just like all of the other failed fiat currencies of the past. Whenever the Federal Reserve turns on the printing press and starts monetizing the debt (the Federal Reserve is buying Treasury bills because nobody else will buy them), you can bet the financial system as we know it will cease to exist. Germany comes to mind, along with Argentina and Brazil. The next 10 years (there is no way to predict the length of the pain) will be very painful. Has anyone been watching the price of precious metals? That should be a good indicator of what is to come. I believe the printing industry will do better than most other industries and I am sticking with it. Good luck to my fellow cohorts in the label converting and packaging industry!